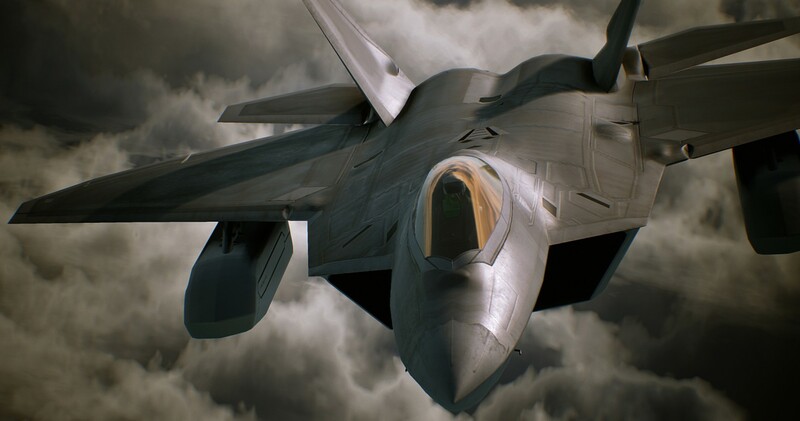 Ace Combat 7: Skies Unknown is an adrenaline-filled thrill ride that soars high with excellently crafted dogfights, responsive controls, and payloads large enough to crack the planet in half. 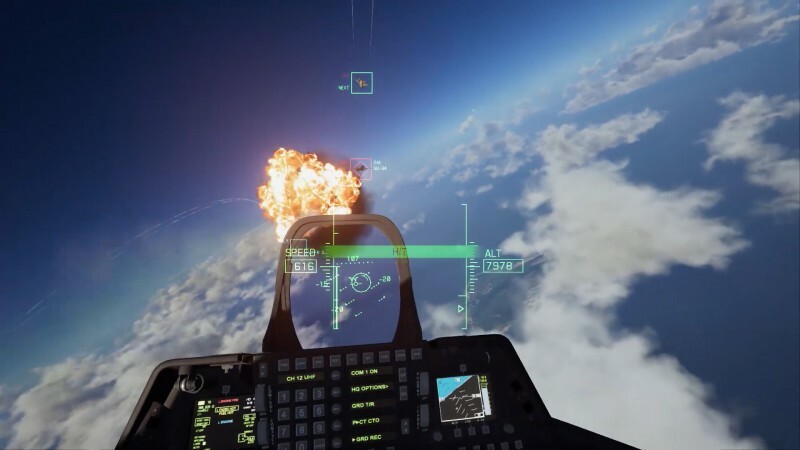 As your fighter rips through a narrow canyon in pursuit of a bogey with a death wish, Ace Combat 7 delivers top-tier intensity. In these moments, the music swells, your wingmen scream for immediate success, and if your rocket hits the mark, you feel like Luke Skywalker blowing up the Death Star. The battles often culminate in exciting and nerve-wracking ways, but not without some turbulence. 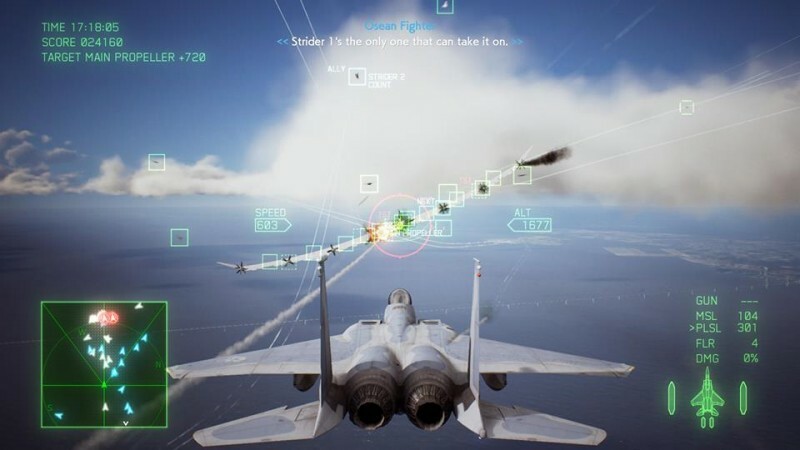 Developer Project Aces taps into the latest military technology to introduce new planes and more potent adversarial forces for the series, but the overall game design resembles an old warbird that feels like it’s going to shake apart before it reaches the runway. The missions, their pacing, and the rewards they bring leave much to be desired. 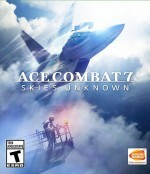 The game is designed to be a throwback to the glory days of the series, drawing heavily from the gameplay direction of Ace Combat 5: The Unsung War. While honing in on what made combat great in that title, missions have a lot of downtime, and objectives like scoring challenges feel like filler activities in between the meaningful dogfights. When you are engaged with rival ace pilots, different weather conditions often up the challenge; you may need to dart into the clouds of a raging storm to trail an adversary. This affects visibility conditions, and your plane gets batted around by strong winds – maybe even struck by lightning. When this happens, the electrical surge scrambles the HUD, making targeting and tracking enemies more difficult. It’s a little annoying to lose targeting, as it seems like it comes down to the random chance of a lightning blast, but it ups the chaos and makes you panic – it’s effective. Weather and low altitudes are also used to give missions a layer of complexity. For instance, you sometimes must fly at dangerously low altitudes to avoid radar detection – the series’ version of stealth, which functions well and delivers plenty of excitement in slower moments of specific missions. The dogfighting mechanics are Wright-brothers-old in terms of gameplay design, but are still reliable, dynamic, and all about outsmarting your foe. After highlighting an enemy, the dance of positioning begins, with a large green arrow telling you which way to fly. To an onlooker, this may look ineffective at times, as your plane appears to be looping aimlessly, but the goal is to line up behind your adversary as close as possible for a quick rocket blast that can’t be evaded with flares. This process is as challenging as it is thrilling. As you spin through the air, you and your adversary exchange lock-on warnings before one of you eventually lands a shot. The skill-sapping targeting from Ace Combat: Assault Horizon is nowhere to be found in this installment; it’s old-school Ace Combat design against the series’ hardest foes and it's glorious. Yes, you square off against a new group of rival aces, but the biggest threat comes from drones, which can turn on a dime and are not affected by g-forces. These new threats are tied to a complicated story that once again sees the Osean Federation locked in war with the Kingdom of Erusea. The Ace Combat series has told great stories in the past, but this is not one of them. It begins as a fascinating tale about a mechanic struggling to find her place in her family’s shadow, but quickly becomes a preposterous journey of prisoners being forced to fly fighter jets to save the world. It plays out like a Fast and the Furious story that is trying to be touching and serious, but it just doesn’t mesh. I ended up laughing at the sheer ridiculousness of it all, but yes, it does make for some silly fun. Over the course of the 20 story-based missions, you earn credits to purchase aircraft, weapons, and upgrades, but you can’t freely pick what you want. You need to purchase items along paths that make up a sprawling, spiderweb-like store. If you see a plane you want, you may have to buy some stuff you don’t desire just to reach it. This design keeps the balance in check, as souped-up craft are at the ends of the paths, but it creates the problem of the using the same vehicle for numerous missions in a row, as you likely can’t afford other planes that will make a difference when you need them. The series was better off when it handed out planes as rewards for progress and kills. You can earn additional money by venturing into multiplayer, which includes an eight-player Battle Royal mode (no, not "royale," but it is everyone against everyone). Taking on other players is a test of skill, but almost every one of my matches ended with no one being downed. The player that dealt the most damage ended up winning. Part of the problem is a five-minute time limit, but it mostly comes down to the evasion and dogfighting tactics being damn good and players knowing how to survive. The homing capabilities of missiles definitely could use a boost here, as the matches end up going nowhere. You see a couple of enemies go down in team death match, which allows for multiple planes to engage a singular target, but battle royal has been hilariously uneventful for me. For fans of this long-running series, this is the Ace Combat we’ve known and loved for decades, and it’s great to have it back. The dogfighting is rightfully the highlight and will give your reflexes a good workout. The PlayStation 4 version comes with an exclusive PlayStation VR mode that makes no concessions in how the game is played. Rotation speeds are virtually the same, meaning you’re going to feel it. Using head movement to help track enemy vessels is pretty damn cool, and the sensation of movement is wild – especially when spinning or flying close to the ground. The entire game cannot be played in VR, and the headset is only used for a unique mini campaign, which is fun in its own right. The VR aspect isn’t a selling point, but if you do have the headset already, it is worth checking out for the sensation of hitting extreme Gs. Just make sure you have a barf bag nearby. This is the Ace Combat we’ve known and loved for decades, and it’s great to have it back.